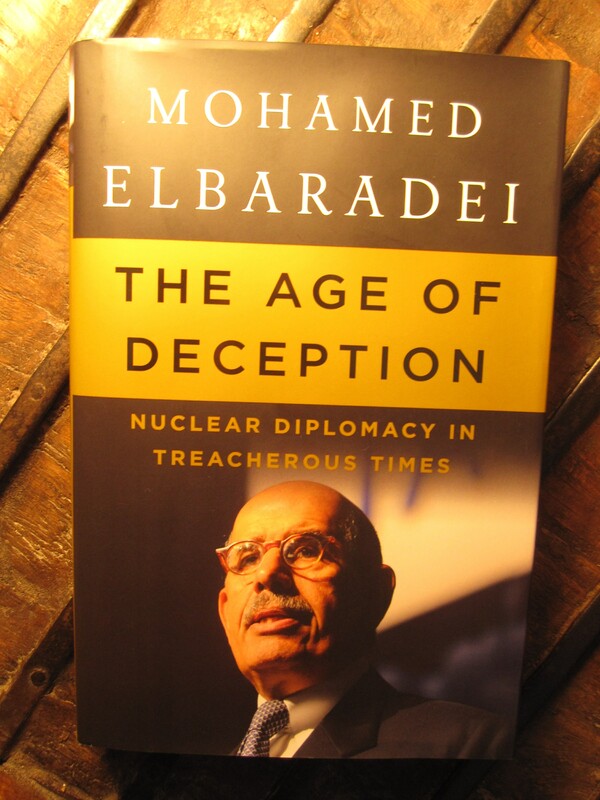 According to former UN nuclear watchdog Mohamed ElBaradei’s recent account The Age of Deception – Nuclear Diplomacy in Treacherous Times, there have been just a few good men who were struggling, after having had painfully experienced large-scale fabrication of “evidence” about Iraq’s alleged WMD program in the 1990s and early 2000s, not only for nuclear non-proliferation but for preventing an imminent strike on Iran, the third war in the Middle East launched by the U.S. and its allies in not even a decade. The 2005 Nobel Peace laureate (together with his organization, the International Atomic Energy Agency) grants revealing looks behind the scenes of international diplomacy. The key players, the U.S., EU-3, Russia, China, Iraq, North Korea, Libya, the A.Q. Khan network, Israel, Syria and, of course, Iran had kept him busy during his three terms as Director General of the IAEA. Before and after having been awarded the Nobel Prize, ElBaradei had been a highly controversial figure to either side; certain rogue states, and the West. As a Muslim he had been put under general suspicion of being biased toward the numerous nuclear capability efforts in the Middle East; and hostile to Israel, the only state of the region with a huge arsenal of (undeclared) nuclear weapons. Well, after having read his book that might be true to some extent. One can easily imagine, though, what has to be expected of the new Director General of the IAEA, Yukiya Amano, who seems to be rather biased toward American demands. As regards Iran, ElBaradei’s narrative reads like a crime thriller. That the December 2007 National Intelligence Estimate by America’s 16 intelligence agencies stopped, literally in the last minute, the Bush/Cheney administration of striking the country seems to be more fact than fiction. The estimate (i.e., Iran has halted, with high confidence, its military nuclear program in late 2003) seems to confirm the IAEA’s own findings which were, however, pretty uncertain due to Iran’s lack of full cooperation. What is quite disturbing is that the IAEA was not provided with respective intelligence by the Americans either. ElBaradei reports that he frequently is confronted with a question like this: “What do you really think – is Iran trying to build a nuclear weapons program?” Reading his answer to that is worthwhile (p. 211f). “My assessment is a gut feeling informed by historical context. First, elements of Iran’s nuclear procurement and research programs began in the mid-1980s, in the middle of the Iran-Iraq War. Iran was at the time under dire threat from Iraq; more than one hundred thousand Iranians, including civilians, reportedly fell victim to Iraq’s chemical weapons. Faced with this extreme sense of vulnerability, the Iranians might have originally intended to develop nuclear weapons. But at some point – perhaps after the war ended or in the mid-1990s, when records show abrupt adjustments to some of Iran’s nuclear programs, or perhaps after the Agency began its investigations – Iran may well have decided to limit its program to the development of the nuclear fuel cycle, legitimately remaining a non-nuclear-weapon state party to the NPT (nuclear Non-proliferation Treaty). In any case, my belief is that Iran has not revealed the whole truth about the beginning of its nuclear program. There might have been some military involvement in nuclear procurement and nuclear experiments. However, these skeletons in the closet are, in all probability, fairly insignificant; the body of evidence would otherwise be greater and harder to conceal. “A second question frequently posed to me is why Iran has remained so intent on pursuing uranium enrichment in the face of sanctions and Western condemnation. My best reading is that the Iranian nuclear program, including enrichment, has been for Iran the means to an end. Tehran is determined to be recognized as a regional power. That recognition, in their view, is intimately linked to the achievement of a grand bargain with the West. Even if the intent is not to develop nuclear weapons, the successful acquisition of the full nuclear fuel cycle, including enrichment, sends a signal of power to Iran’s neighbors and to the world, providing a sort of insurance against attack. Each of the factions in Iran understands that the nuclear program is in itself a deterrent. There is a clear consensus domestically that Iran needs to maintain that deterrence. Overall, though, Iran’s goal is not to become another North Korea – a nuclear weapon possessor but a pariah in the international community – but rather Brazil or Japan, a technological powerhouse with the capacity to develop nuclear weapons if the political winds were to shift, while remaining a non-nuclear-weapon state under the NPT. Last modification May 30, 2011. This entry was posted in Book Review and tagged double standards, IAEA, Mohamed ElBaradei, NPT, nuclear non-proliferation, Yukiya Amano. Bookmark the permalink.